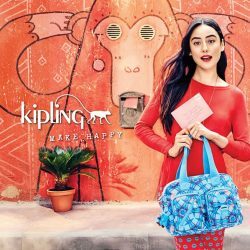 Get festive in style with Kipling's YEAR-END SALE Preview with up to 30% OFF sale items from 10 to 16 Nov 2016! What’s more, Kipling Friends get to enjoy an EXTRA 30% OFF* with purchase of 2 items! Shop to your hearts content this GSS with our ION Holideals – enjoy $30 off all items at Kipling! Grab this from our ION Orchard app today! 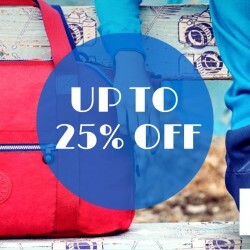 Enjoy these promotions of up to 25% off at Kipling! Get one bag for yourself and another for your mum for the upcoming Mother's Day now! Hurry just for 5 days! 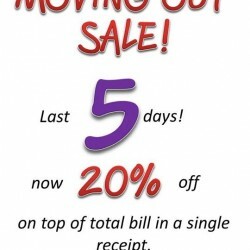 Moving out sale! Now 20% off on top of total bill in a single receipt. 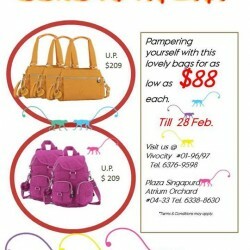 For the last few days for Plaza Singapura there will be additional 20% off. Hurry & grab your items!! Most awaited Sales in the month of May is now on. 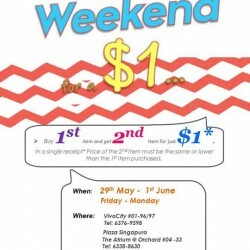 Buy 1st item and get 2nd item for just $1 @ Kipling. Gong Xi Fa Cai! Pampering yourself with this lovely bags for as low as $88 each (UP: $209) until 28 Feb 2015. Chinese New Year Sale! 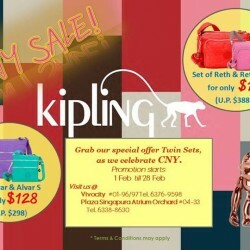 Kilping brings you special offer Twin Sets, as they celebrate CNY. From 1 Feb until 28 Feb.